A son of Judah ibn Abbas of Fez; lived in the twelfth century. Joseph Sambari and the "Yuḥasin" call him Samuel ben Azariah ("Rev. Ét. Juives," iv. 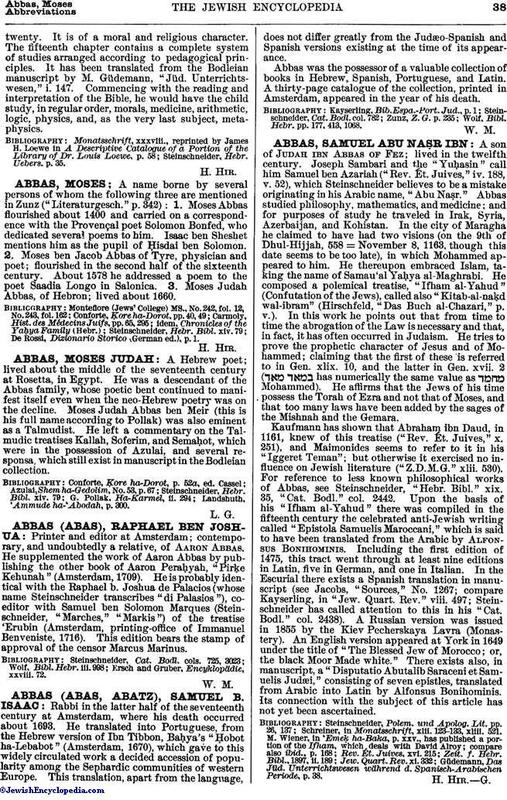 188, v. 52), which Steinschneider believes to be a mistake originating in his Arabic name, "Abu Naṣr." Abbas studied philosophy, mathematics, and medicine; and for purposes of study he traveled in Irak, Syria, Azerbaijan, and Kohistan. In the city of Maragha he claimed to have had two visions (on the 9th of Dhul-Hijjah, 558 = November 8, 1163, though this date seems to be too late), in which Mohammed appeared to him. He thereupon embraced Islam, taking the name of Samau'al Yaḥya al-Maghrabi. He composed a polemical treatise, "Ifham al-Yahud" (Confutation of the Jews), called also "Kitab-al-naḳd wal-ibram" (Hirschfeld, "Das Buch al-Chazari," p. v.). In this work he points out that from time to time the abrogation of the Law is necessary and that, in fact, it has often occurred in Judaism. He tries to prove the prophetic character of Jesus and of Mohammed; claiming that the first of these is referred to in Gen. xlix. 10, and the latter in Gen. xvii. 2 ( has numerically the same value as Mohammed). He affirms that the Jews of his time possess the Torah of Ezra and not that of Moses, and that too many laws have been added by the sages of the Mishnah and the Gemara. Kaufmann has shown that Abraham ibn Daud, in 1161, knew of this treatise ("Rev. Ét. Juives," x. 251), and Maimonides seems to refer to it in his "Iggeret Teman"; but otherwise it exercised no influence on Jewish literature ("Z.D.M.G." xlii. 530). For reference to less known philosophical works of Abbas, see Steinschneider, "Hebr. Bibl." xix. 35, "Cat. Bodl." col. 2442. Upon the basis of his "Ifham al-Yahud" there was compiled in the fifteenth century the celebrated anti-Jewish writing called "Epistola Samuelis Maroccani," which is said to have been translated from the Arabic by Alfonsus Bonihominis. Including the first edition of 1475, this tract went through at least nine editions in Latin, five in German, and one in Italian. In the Escurial there exists a Spanish translation in manuscript (see Jacobs, "Sources," No. 1267; compare Kayserling, in "Jew. Quart. Rev." viii. 497; Steinschneider has called attention to this in his "Cat. Bodl." col. 2438). A Russian version was issued in 1855 by the Kiev Pecherskaya Lavra (Monastery). An English version appeared at York in 1649 under the title of "The Blessed Jew of Morocco; or, the black Moor Made white." There exists also, in manuscript, a "Disputatio Abutalib Saraceni et Samuelis Judæi," consisting of seven epistles, translated from Arabic into Latin by Alfonsus Bonihominis. Its connection with the subject of this article has not yet been ascertained. Schreiner, in Monatsschrift, xlii. 123-133, xliii. 521. Güdemann, Das Jüd. Unterrichtswesen während d. Spanisch-Arabischen Periode, p. 38.